I have literally been eying the ONA Camera bags since f o r e v e r (or at least since they first launched) and am so thrilled to have received a “Capri” bag in dark tan to test out and review. I really truly think I have found “the one” – at least in an everyday camera bag that is! 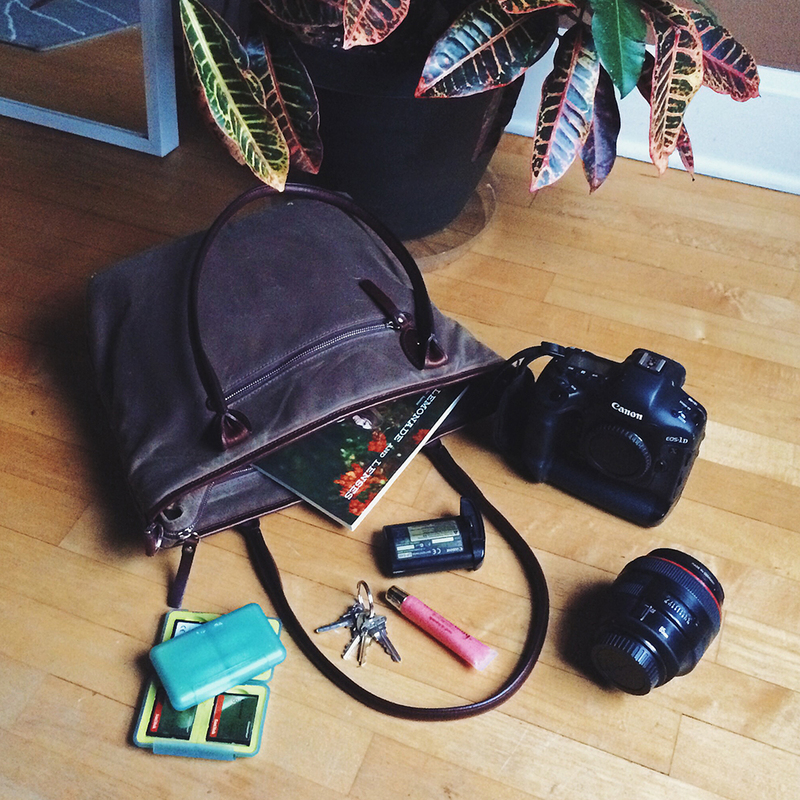 Keep reading to check out my review of this beautiful camera bag! Personally, I have struggled with some shoulder & back pain, so having a camera bag that is uber light-weight is crucial. It didn’t dawn on me until recently to check out the weight of the camera bag by itself and the Ona Capri is light as a feather!! Only 1.6 pounds – PERFECT. I urge you when checking out bags to factor this in, especially if you will be carrying this around a lot, or need to carry it while you are photographing. I usually set my camera bag down when I’m working, but this bag was so light that I was able to carry it the whole time I was taking photos – even with just the handle straps (not the cross-body strap). 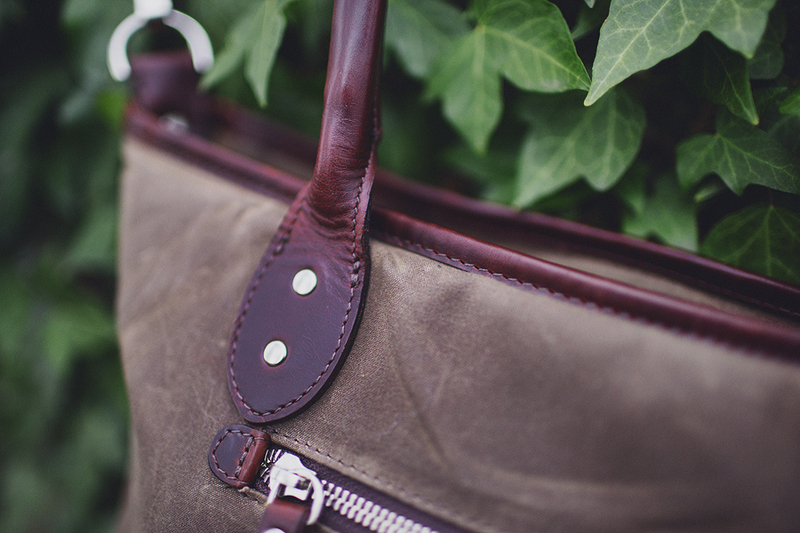 I’ve taken this bag to a number of photoshoots already in the past few weeks since getting it – and yes, even in the rain!! 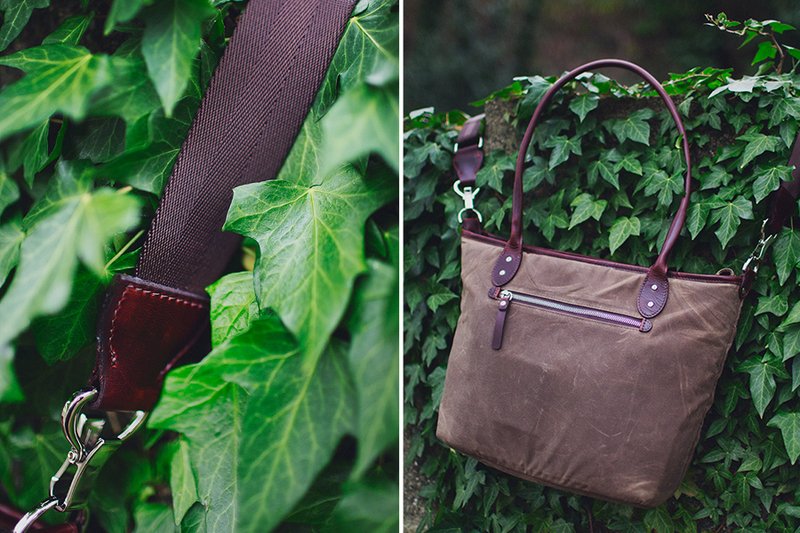 The waxed canvas is so perfect for photographers working in more extreme climates. The water just repels right off the bag! 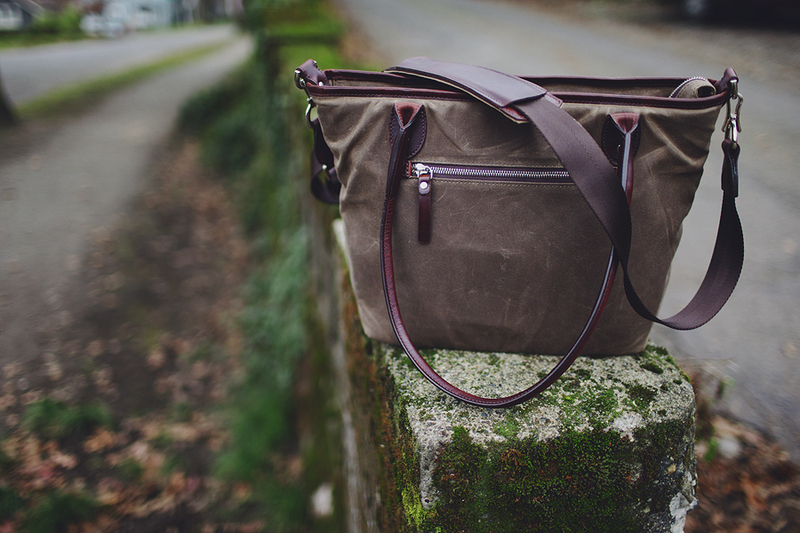 While I originally wanted the leather version, the waxed canvas is going to be so perfect for me since I schlep my bag through mud, rain, dirt and gunk all year long. The bag itself measures about 15 inches across and 11 inches tall. There is one main zipper that opens up to the entire bag. It’s easy to see inside the bag, but it also stands upright on it’s own (I hate when a camera bag doesn’t stand upright!). 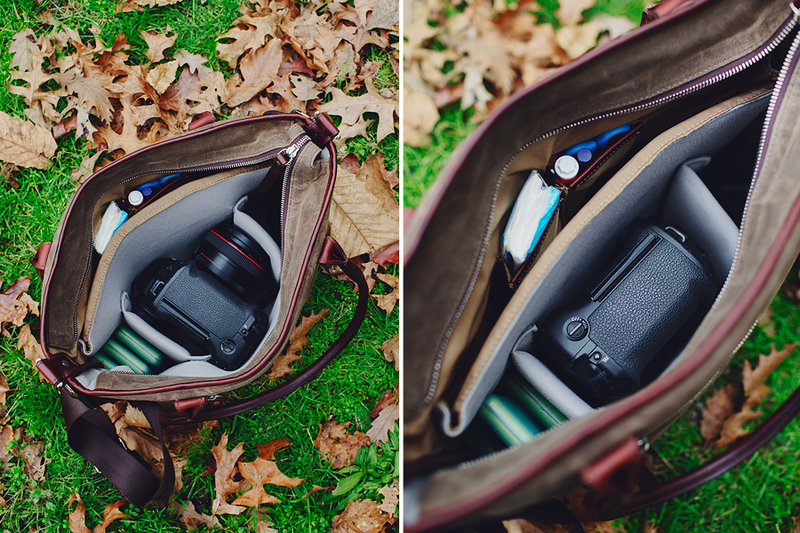 The bag is split in half length-wise so you can slide a laptop on one side and your camera gear on the other. It comes with velcro dividers so you can make nice homes for your camera body, lens, etc. I split this section up in to thirds so my camera fits snug in the middle with my lens(es) on one side and my CF Cards and extra battery on the other. The bag zips closed very easily, and you can stick the camera back in the bag easily with a 50mm or 85mm still attached (and still zips closed!) when you are walking from location to location. I love that the handles are super long (the drop is about 11 inches), so it is very comfortable to sling over your shoulder. You can also use the adjustable nylon, cross-body strap to carry the bag. There is a small pad that moves around the nylon strap so you can place on your shoulder for added comfort. 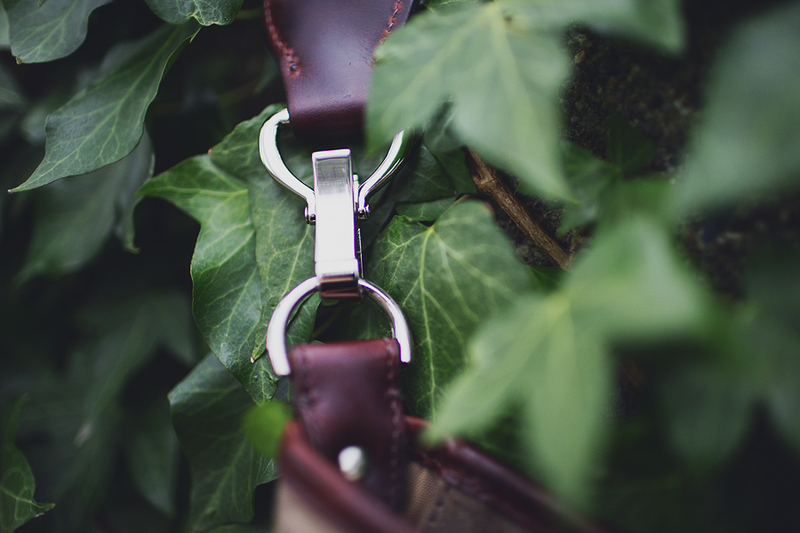 This strap is easy to clip on and off the bag – and won’t accidentally come un-clipped when you are out and about. 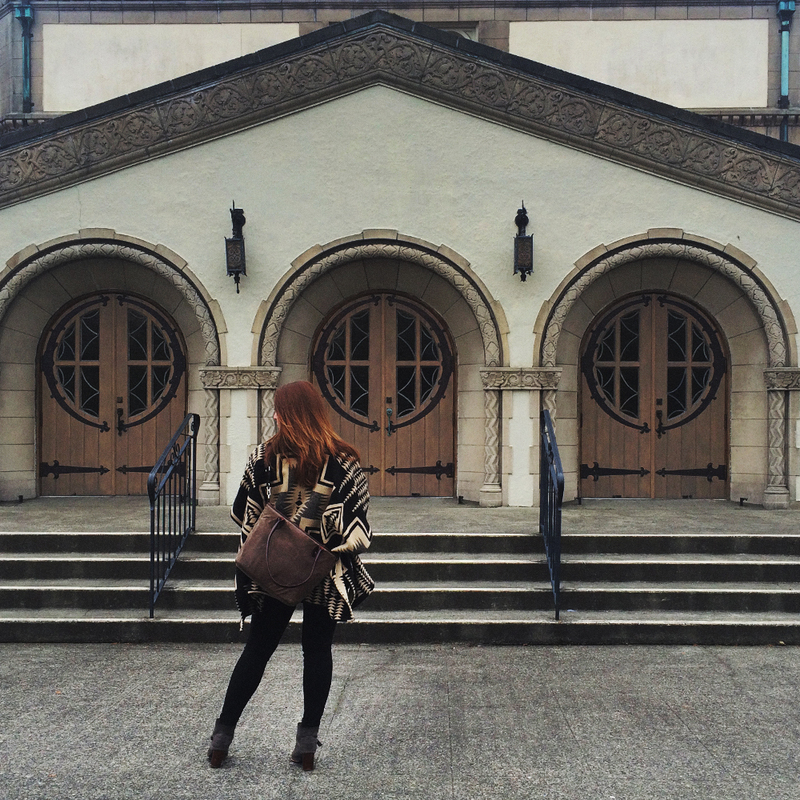 Honestly there is nothing to dislike about this bag – and I am literally in love with it! It’s perfect for my shooting style, and the fact that it is so light-weight makes me happy!! PS, I did just get a brand-new 50mm lens, and I will be switching to this as my primary lens this year because of it’s versatility and weight! Learn more about ONA on Facebook and Instagram! This review is original and solely the opinion of Michelle Moore. Check out more of our original reviews! Some of my links are “affiliate links” and help keep this website running. Thank you for your support by using these links!